One of the hallmarks of human intelligence is to be able to incorporate learning, and to get smarter over time as new data gets integrated into your brain’s knowledgebase. Traditionally, computers are not considered intelligent, as while they have spectacular computational abilities, they must be programmed quite precisely to harness this power, and do not have any ability to integrate learning. Rather, they must be reprogrammed to encompass improvements – often indicated as Program 2.0 to designate the newer, and hopefully better version of the software running on the computer. Machine learning is the branch of computing that incorporates algorithms to analyze data which is inputted, and via statistical analysis can make a prediction on an output, while incorporating new data as it becomes available, to update the predicted output. In other words, the algorithm allows the computer to incorporate new data, and update its algorithm over time, so that learning is effectively taking place. A closely related, and sometimes considered almost synonymous term, is artificial intelligence – although some would argue that artificial intelligence is considered the broader term of which machine learning is a subtype. The phrase machine learning dates back to 1959, when Arthur Samuel, a pioneer in the fields of computer gaming and artificial intelligence and a research professor at Stanford University, defined it as the “ability to learn without being explicitly programmed”. He had an interest in machine learning with regards to checkers, which he perceived to be an ideal subject due to the simplicity of the game. Due to the lack of available computing power at the time, rather than attempt to run every possibility, his algorithm used alpha-beta pruning (a variant of the Minimax algorithm) to choose a move based on the position of the pieces, including the location of king pieces, and the likelihood of a win. He put his theories into practice in 1961 when his program won a match against the Connecticut state checker’s champion, considered the fourth ranked player in the nation at the time, lending credence to his work. This paved the way for more ground-breaking work in the field of machine learning. This includes the famous 1997 match where IBM’s supercomputer Deep Blue, after an initial loss the year before, was able to beat world champion Garry Kasparov in a series of matches in the more complex game of chess. Even more recently in 2016, Google took on the even more complicated game of Go, a popular Chinese board game known for its high level of strategy. Using the AlphaGo algorithm for machine learning, a product of Google DeepMind, a professional player was beaten in an impressive five consecutive games. Machine learning has been applied to more than just games. In 2012 at Google X Labs, a machine learning algorithm was designed to go through YouTube videos, and independently identify those that have a cat in the video stream. By 2014, Facebook had a machine learning algorithm, DeepFace, that could match images of faces to a person with over 97% accuracy, which approaches the performance of a typical human when it comes to that task. In order to facilitate more projects, in 2015, Microsoft debuted its Distributed Machine Learning Toolkit, which currently includes Distributed (Multi-sense) Word Embedding for high quality natural language processing. The technology of machine learning has also been applied to robots and their ability to carry out complex tasks autonomously. There has been interest in military applications, and this has caused many tech luminaries, including Stephen Hawking and Steve Wozniak, to send an open letter to the UN. Their concern is that weaponized machine learning represents a “third revolution in warfare”. On the other hand, autonomous technology promises to make cars safer to drive, and this was recently showcased with the tech implemented in a classic vehicle, a 1965 Ford Mustang, at the Goodwood Festival of Speed. Businesses have also embraced machine learning, and an example of this is automated chatbots that reduce levels of customer interaction with more expensive customer support employees. There’s also a trend to move away from phone interaction menus (“press one for this, press two for that”) that generally annoy customers, towards text interaction. For example, late in 2017 the Royal Bank of Scotland debuted its new AI chatbot, Luvo, a web chat tool that pops up on the bank’s website and inquires about whether the customer has any questions. The goal is to have Luvo help 10% of customers, with the ability to answer simple questions directly, and direct others with more complicated issues to the correct human agent to provide more definitive help. The thinking is that by having Luvo handle the simpler tasks, this frees up human advisors for the more complicated customer issues. 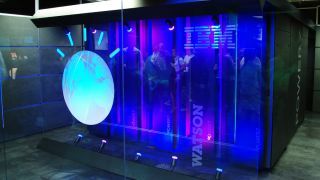 This particular virtual chatbot is powered by IBM’s Watson Conversation tool, widely regarded as one of the most advanced AI engines, with a particular strength in natural language recognition. This incorporation of machine learning in the form of a chatbot at the Royal Bank of Scotland, driven by cost and time savings for customer service, is part of a wider trend, which other companies have embraced with obvious dividends. However, Facebook shut down its text-based chatbot, M, earlier this year, so the transition is hardly seamless as viable applications for this technology are sought. Machine learning has also been applied to online music streaming. Over at Spotify, the sprawling on-demand music service with over 100 million users, the firm applies machine learning to stream music that matches your musical taste. Especially popular is Spotify’s ‘Discover Weekly’ feature that has what appears to be a handpicked list of songs based on your listening habits – kind of like a good friend who knows your listening habits making a mix tape to introduce you to new artists. However, this is achieved through machine learning algorithms that incorporate data from collaborative filtering which analyzes your listening behavior and similar fans, along with natural language processing which incorporates text, and audio analysis of the tracks directly. All of this data goes through the company’s machine learning algorithm to generate these music picks, and this undoubtedly contributes to Spotify’s popularity – while some competing services, like Songza and Pandora, choose songs based on manually tagging them without the additional data that Spotify employs. With machine learning able to best human champions at multiple strategic board games, the power of these algorithms that can incorporate new data into their decision-making process has been clearly demonstrated. And now, diverse industries, from customer service, through autonomous driving, to curated music streaming, have shown the power of incorporating machine learning algorithms as well.